Wembley Stadium builder Multiplex has denied it should be held totally to blame for delays in the project. It was confirmed on Friday that the £757m stadium will not host any events until 2007 with delays leaving a threat of compensation hanging over Multiplex. But Multiplex said in a statement: "The construction of Wembley National stadium had been subject to many design changes, historical and ongoing. "The changes have implications on time and under the terms of our contract." The Australian firm's managing director, Martin Tidd, said in the statement: "During interviews, Wembley National Stadium Limited advised that they believe that 100% of delays to the project are the responsibility of Multiplex. We wish to refute this claim. 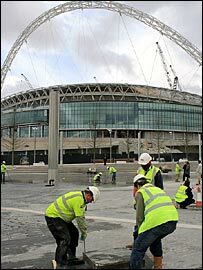 "A fixed price contract was entered into with Wembley National Stadium Limited reflecting a defined scope of works. "The contract is adjustable in the event of change by the client. On a project of the size and complexity of Wembley, it would be unprecedented for no changes to have been made as suggested earlier." The FA Cup final on 13 May was due to be the first match played at the new national stadium. But building is now not expected to be finished until the end of September, after which three months will be needed to carry out safety tests and fit out the stadium. Wembley National Stadium Limited (WNSL), a subsidiary of the FA, is handling the project and its chairman Michael Cunnah claimed Multiplex had given it six revised construction programmes. The penalty clause in the contract is believed to be for £140,000 per day and WNSL seem determined to enforce this payment. WNSL chairman Michael Cunnah said: "The financial issues between ourselves and Multiplex are just that - between us and Multiplex and we have a fixed price contract that we are very happy to rely upon. "We would reject any claims from Multiplex to the contrary." But the two parties appear to be heading for a dispute after Multiplex company secretary Mark Wilson said "no further adjustments to the project's financial position are anticipated".